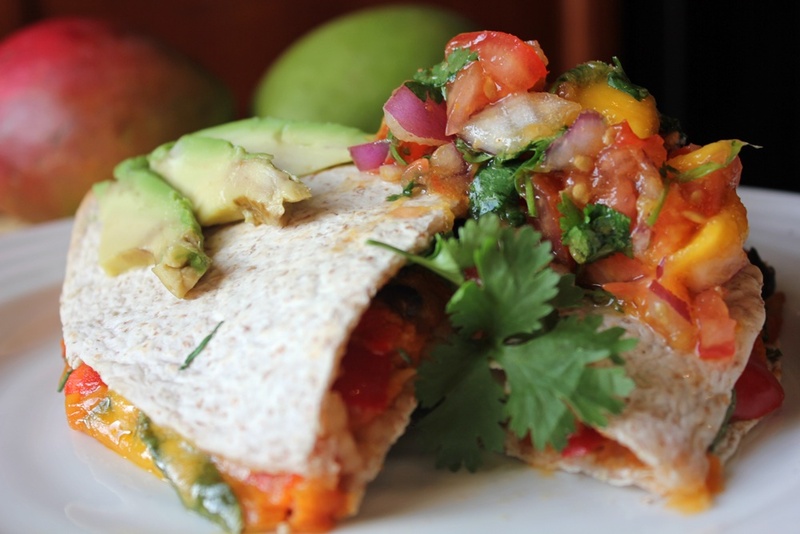 This spicy quesadilla is exploding with flavour. It is a super-filling, healthy and satisfying dinner that everyone enjoyed. The recipe is from the Meet the Coup Cooks cookbook which is from my favourite vegetarian restaurant The Coup in Calgary, Alberta. I made a few minor changes to avoid using oil, and I baked them instead of pan-frying. They turned out so well! I can’t wait to eat the leftovers for lunch tomorrow! Place on a lined baking tray and roast at 360F for 40 minutes or until yams are super soft. In a food processor place roasted yams and onions, chipotle peppers, garlic cloves and blend until smooth. On one side of each wrap place the yam mixture, black beans, spinach, peppers, green onion, cheese and cilantro. Fold in half and place on a baking sheet. Bake at 400F for 8-10 minutes or until cheese is melted and wraps are crisp. Bravely I took on the task of cooking dinner for 4. Potentially tricky as it was for 2 vegetarians and 2 non-vegetarians. Since I decided to cook a vegetarian meal, I felt like the pressure was on. Usually when I have guests over who are carnivores, I bravely venture into the land of purchasing and preparing meat. I struggle with this for all of the obvious reasons. For the first time ever, I decided to make it all veggie. I knew it had to be good. On the menu: pineapple salsa and guacamole with blue corn tortillas, spicy jalapeño black bean burgers and oven cooked sweet potato fries with chipotle mayo. It seemed like I had a delicious menu lined up, but I was nervous. I would love to report the meal was a huge success, however I only won over my fellow vegetarian. The rest of the feedback consisted more of… silence. Not complaining, not overjoyed. I however, loved the spicy burgers! So, although I was quite pleased, I will continue on with my quest to create a burger that keeps everyone – meat-lovers included – coming back for more. This spicy burger recipe is definitely still on my favourite list. I loved the sweet of the pineapple salsa combined with the spicy jalapeño. Play around with the amount of jalapeños to suit your taste buds. In a small sauce pan combine 1/2 cup quinoa with 1 cup water. Bring to a boil. Reduce to low and cover for about 12 minutes or until water is completely absorbed. Fluff with a fork. In a large bowl mix drained black beans, onion, jalapeño and garlic. Add quinoa. Using a hand-held immersion blender, combine ingredients until smooth. Stir in oats. Refrigerate for 30 minutes. Using a 1/2 cup measure, scoop out mixture and shape into patties. Pan fry burgers until golden brown. 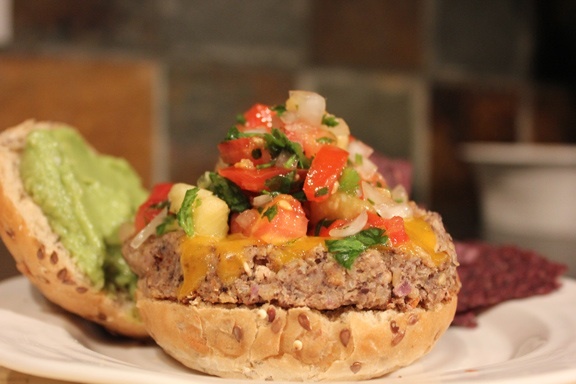 Top with a slice of cheddar cheese and serve with pineapple salsa and guacamole. Enjoy! Layer extras in wax paper in an air tight container and refrigerate. Keeps well and it’s a delicious – not to mention kind of fancy, weekday lunch. Each is 4 weight watchers points plus.